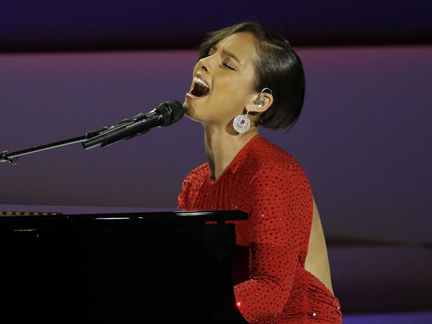 NEW YORK (AP) — Next stop for Alicia Keys? NBA All-Star weekend. The superstar, fresh off her national anthem performance at the Super Bowl, is set to be the halftime entertainment at the Feb. 17 game in Houston. She's just one of several musicians on tap for the big game. Ne-Yo will sing during the player introductions, while John Legend will sing the national anthem. Singer and "Lincoln" actress Gloria Reuben will sing the Canadian anthem. The day before, Nick Cannon is set to host that evening's festivities, which will include performances by "American Idol" Phillip Phillips, Ellie Goulding and the first live TV performance in three years by a reunited Fall Out Boy. The All-Star game, set to feature superstars like LeBron James and Kobe Bryant, will air live on TNT.